The moment I entered my apartment, I heard an odd banging upstairs. Racing into Sam’s room, it looked as if Moe Gulazar’s closet – maybe Moe himself – had exploded all over the carpet. Sequined gold leggings, a mink stole (suffering from mange), silk blouses, and striped neckties were draped everywhere. Nora, in a pair of black jodhpurs and a tuxedo shirt, sleeves rolled up, was packing up the clothes. I noticed Jesus and Judy Garland were no longer taped to the wall. ‘What’s going on?’ I asked. She glanced at me over her shoulder and then turned away, folding a pair of purple hot pants and shoving them into one of the Duane Reed bags. She was folding an old grey cardigan with a sequin flying bird pin on the shoulder and a massive gaping hole in the left elbow that resembled a silently screaming mouth. observations: A second visit to this strange book. It suffers in comparison with Donna Tartt’s The Goldfinch, published around the same time, a similar great shaggy long book featuring successive adventures in someone’s life, and with scenes in New York. Both feature St Mark’s Place, and this photo used for a CiB Goldfinch entry would have easily fitted in for Night Film too. The Goldfinch is much more literary, a wonderful work of art, a serious book about serious things that is also very funny and entertaining. But if you remove Night Film from its shadow, it has a lot going for it – it keeps you reading, it has a very properly thought-out plot, it is funny and fun. Anyone who likes indie films will enjoy the picture of the film industry and the imaginary movies that Cordova makes. Perhaps it could have done with another edit – and the narrator could have been stopped from italicizing quite so many words. The US magazine Slate has a very helpful review of the book, in which Mark O’Connell recommends that you suspend your critical faculties and just enjoy it – this seems excellent advice, and I particularly like his line ‘It’s hard to roll your eyes when they’re glued to the page’. Also, there are plenty of very good clothes descriptions in the book, and Nora, the character above, has particularly fetching ensembles: in this respect only, Night Film is faintly reminiscent of Robert Plunkett’s fabulous My Search for Warren Harding. She was dressed like Lily Munster meets Cinderella by way of punk in a pea-green velvet dress, black crocheted tights, Moe’s motorcycle boots, and black fingerless gloves. - though this also demonstrates one of Pessl’s most annoying quirks, which is the endless, pointless use of unnecessary italics. 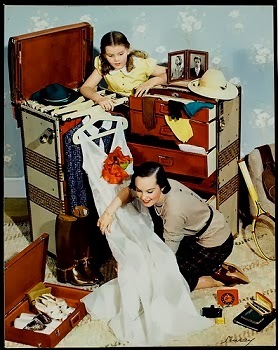 The main picture is a McCall’s magazine cover – it really should be called ‘I’ll see to her packing’ after a favourite phrase from Agatha Christie’s Five Little Pigs, but couldn’t really match it to that book. More packing by Bridget Jones, and in this book, with a really excellent picture – why are both packing lists in novels, and photographs of packing, both so compelling? Another clothes list, for the Fossil sisters, here. 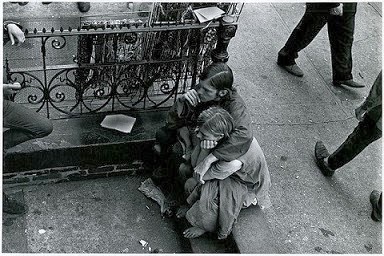 The lower photo is by James Jowers: both are from George Eastman house. Previous entry on this book here. Moira, probably one I can live without TBH. Wavering a little bit, but unlikely - though I did check my previous response - at least I'm consistent. I know, the connection with films is the thing that sways me toward the book. Maybe it will show up at the book sale and I will take a chance. Moira - I love the description of that room at the beginning of your post. And an inside look at the indie film industry can be well worth reading. I remember thinking this might be really interesting the first time you mentioned it but this time I'm getting a bit more of the sense of the wit there is in it. I'm glad you've reminded me of it.